JAG Special Forces operatives like Golden Claw agent Melissa Overton and her partner, Huntley Anderson, are trained for the most dangerous missions in the harshest environments. These hardened jaguar shifters can handle any variable, even . . . babies? Okay, fine, I love the back muscles on the model. And the gaze. And the scruff. And the colors for the cover. Things are about to get HOT in the bayou! Evie Baker’s luck just ran out. Thanks to an ex-partner with organized crime ties, she’s lost her restaurant, her money, and nearly all her self-respect. Forced to return to her hometown and work as a shampoo girl in her mother’s salon, she doesn’t think her luck can get any worse. But then someone starts shooting at her, her sullen baby sister is suddenly missing, and the high school heartthrob who stole her heart—and her virginity—is the only man big enough and bad enough to help. Captain Matt “Richie Rich” Girard can’t afford to get involved. He’s already on the verge of a court-martial after a Top Secret op gone wrong, and he’s been ordered to stay out of trouble while he’s home for his sister’s wedding. But when Evie’s ex-partner turns up dead, staying out of trouble is the last thing on Matt’s mind. He failed Evie once before; he can’t fail her again. If he’s going to protect her from a killer, and find her sister before time runs out, he’ll have to risk his entire future—and both their lives—to do it. FREE -- GRAB HOT PURSUIT! What cover are you currently lusting for? Tell me, I want to know! Follow the directions above on how to post your own Lusting for Covers, and leave a comment telling me what you think of the cover for Jaguar Pride and Hot Pursuit? 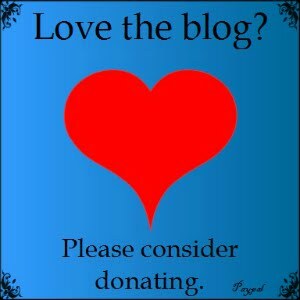 Also, we have a Weekend Giveaway going on at the blog's Facebook page -- enter HERE! 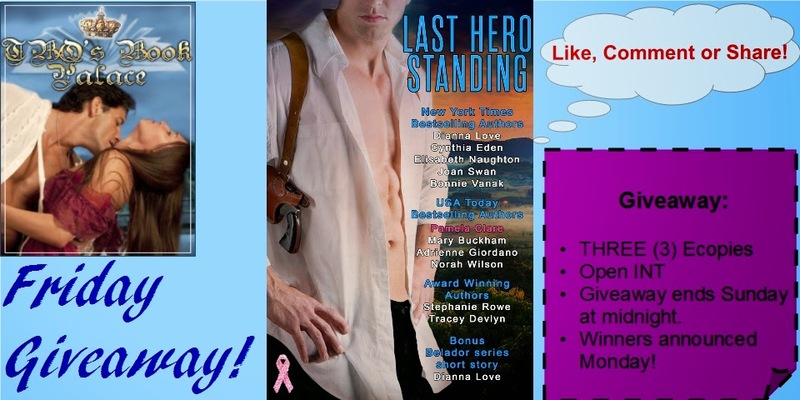 There will be three winners; each will receive an ecopy of the romantic suspense anthology, LAST HERO STANDING! Ends Sunday at midnight. Good Luck! 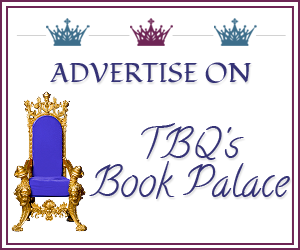 TBQ, your cover is HOT......back muscles and all! A lost for words. I don't think my cover is going to help me recover my thoughts either. LOL. WOWZERS!!! Both great cover. 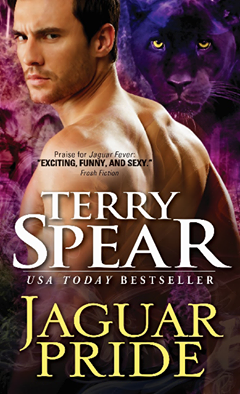 I love Terry Spear, and her Jaguar series is phenomenal and I can't wait to dig into Jaguar Pride. And Well Hot Pursuit.. BOUGHT it already and B&N and I just love free books and it sounds great. Definitely will be reading it soon. Thanks for sharing hun. Hope you are enjoying the "cooler" weather. Wowzers, indeed! :) I still haven't read any of Terry's books, but have all of them on my wishlist. Ugh, we only got maybe 2 inches of snow, but that's 2 inches more than I wanted! lol And of course I'm still trying to find a decent snow boot for my Hagrid-size feet, with no luck, so that makes the whole snow-and-cold thing that much more annoying for me! Stay warm, my friend! :D Gotta love some yummy back muscles, right? ;) Between the cover, the price, AND Kame's recommendation? Yep, I one-clicked that baby, too! Alright, love the purple of both covers. And while the guys are really lustworthy, I love that panther staring right at me too. Nice picks! Love Terry Spear covers. I have Hot Pursuit. *hugs* It's been a while! Yes, Spear has great covers. I still need to read her books; so far they're on my list!